Would I have BPD on a desert island? An interesting hypothetical question that I used to ask myself all the time. Except I didn’t know what BPD was, so I’d ask it with respect to specific component/symptoms instead. Ask yourself that question now (or if you don’t have BPD, ask a relevant version). Would you still have an eating disorder if you lived entirely alone on a on a desert island? Would you still cut yourself on a desert island? Would you really be unable to get out of bed (or your coconut fibre hammock or whatever) on a desert island? I took this answer to mean that my mental illness was superficial and fake. That it was created, by me, for attention. That it had everything to do with other people and random circumstances and performance-related reasons, and very little to do with my actual brain/soul/self. That was one way of looking at it. And, as was usual for me back then, it was an extremely self-critical and disparaging way of looking at it. 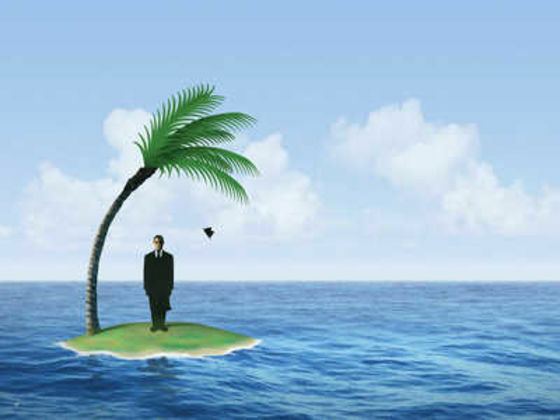 In a way, my old self was right: I probably would not exhibit many symptoms if I lived alone on a desert island. Why? Because so much of BPD is about interpersonal relationships. Triggers often come from how people treat us, what they say, etc. That doesn’t mean I’d be happy living in total isolation (another situation I often mistakenly fantasized about), but I probably wouldn’t be triggered either. No real joy and no real misery. And isn’t that the whole reason we put ourselves on (real or metaphorical) desert islands? To say “I’m done opening my heart to people” is to try and live on just such an island. The convincing fallacy is that without the highs, there are no lows. Unfortunately, life has a very effective way of making you feel its inevitable lows, regardless of what you’ve planned out — and once you’re cut off, there’s no one to help you with them. Womp womp. “No real highs and plenty of real lows” is the more accurate description of isolating yourself from other people. But to say I wouldn’t have BPD on a desert island is only partly true. I probably wouldn’t self-harm, but I know I’d still feel sad, depressed, and maybe even suicidal at times. The cool thing is, I now see the use of this scenario: I can use the desert-island question to determine, very clearly and quickly, when I need to feel something (an inner emotion) and when I need to say something (an outward action). It’s remarkably useful for someone who, once a wave of emotion hits, can’t always figure out what she wants or needs. For instance, if I’m so angry that I’m about to leave the house, drive off, turn off my phone and leave a loved one wondering where the hell I am, I can (hopefully) take a pause and ask myself: Would I still be about to do this if I was dropped on a desert island right now? If the answer is no, then I know that what I’m doing is, in fact, about communicating my hurt to someone, and I need to say/do something — that is, I know that I need to draw my focus outwards, away from my own emotion and towards effective communication with others. Conversely, when I’m on the brink of crying over something someone’s said, I ask myself the same question, and the answer is almost always yes — yes, I would still want to break down sobbing alone on a desert island. That’s how I know that I need to feel something, experience something and draw my focus inwards instead of outwards. I don’t mean to oversimplify: obviously, there’s a lot more to it than this, and it’s far from easy for me to step back, ask myself this question, then calmly answer it and react appropriately. But you know me: I’ll take any and every helpful tool I can get when it comes to handling my emotions, and I’ve found this rather odd mind set to be a pretty insightful one at times. I hope it can help someone else too. Author halfasoulPosted on March 28, 2017 May 31, 2017 2 Comments on Would I have BPD on a desert island?